Nuclear plants in Illinois have provided about half of the state’s total electricity generation since 2010, and two nuclear plants in particular—Quad Cities and Clinton—together provided more than 12% of the state’s electricity generation over the past several years. However, in May 2016, Exelon, the owner of these plants, revealed that they had collectively lost more than $800 million dollars over the previous six years and announced plans to retire them in 2017 and 2018. In December 2016, Illinois enacted the Future Energy Jobs Bill, which provided financial support for existing nuclear power through 2026 through a zero emission credit (ZEC) mechanism. Exelon subsequently announced the cancellation of its plans to retire the Quad Cities and Clinton plants. Illinois ranks first in the nation in both generating capacity and net electricity generation from nuclear power, and accounts for about one-eighth of the nuclear power generation in the United States. The Quad Cities and Clinton plants collectively produced more than 24.5 billion kilowatthours in 2016, accounting for 25% of total nuclear generation in the state. The Illinois Future Energy Jobs Bill established the ZEC as a tradable credit that represents the environmental attributes of one megawatthour of energy produced from the state’s nuclear plants. Illinois’s zero emission standard set the initial ZEC price based on several factors, including wholesale electricity market prices, generation costs, state average market prices, and estimated costs of the long-term effects of carbon dioxide emissions. The ZEC price will be subject to change to reflect prices in electricity generation and capacity markets. The annual ZEC payment is calculated by determining the amount of ZECs a plant received and the average value of the ZEC. The Illinois bill seeks to preserve existing zero emission electricity generation—including nuclear power—and maintain a reliable electric transmission network. State price support for the two nuclear power plants is capped at $235 million annually for 10 years and limits residential bill rate increases to no more than 25 cents to 35 cents per month, depending on the regional electric company. The bill is set to take effect in June, but faces multiple court challenges. Some utilities have concerns that the ZEC violates the commerce clause and affects federal authority to regulate wholesale energy prices. 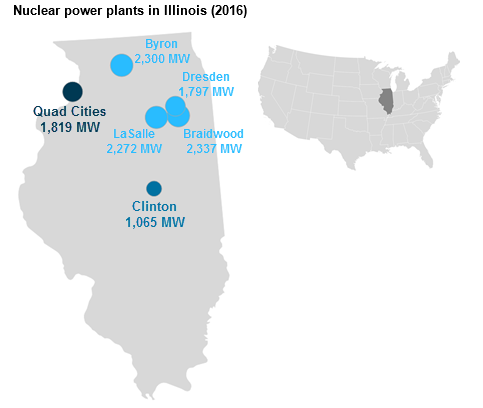 With the decision to cancel the retirements of the Quad Cities and Clinton nuclear power plants, all six of the operating nuclear power plants in Illinois will continue to generate power. Clinton reaches the end of its 40-year operating license in 2026, but is eligible to apply to the Nuclear Regulatory Commission for a 20-year license extension. Unit 2 of the Dresden Generating Station will reach the end of its 20-year license extension in 2029. The four other nuclear plants in Illinois are currently licensed to operate through at least 2031.